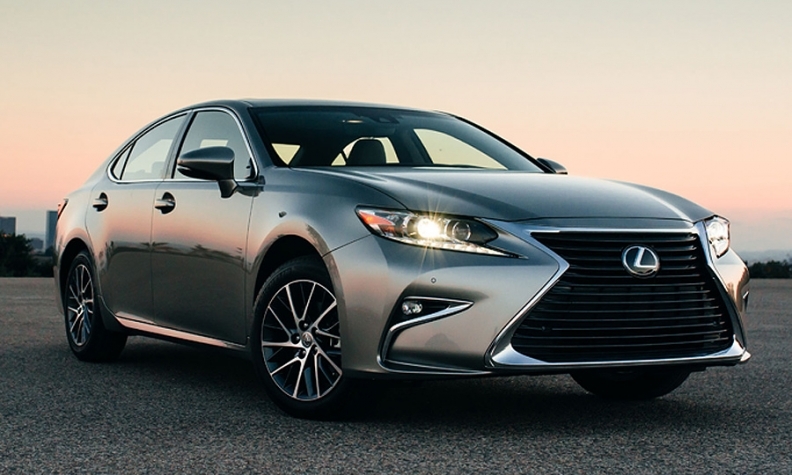 The 2016 Lexus ES 350. Lexus has updated the ES line of sedans for the 2016 model year with a number of stylistic changes as well as new safety systems. The most noticeable change on the outside is the tweaked spindle grille, with the latest iteration having made its worldwide debut at the Shanghai auto show in April. The grille has lost the center stripe that split the outgoing model's vertical bars into two, with the frame gaining additional chrome. The result is a larger, uninterrupted mouth that now dominates the front fascia, with only the Lexus badge at the center breaking up the uniformity of the surface. The LED headlights have also been tweaked and now sport a sharper look, while the foglight surrounds now complement the lines of the lower part of the grille. The taillights have also been restyled, gaining sharper angles, while the rear fascia now features rectangular exhaust tips. Three new exterior colors join the lineup for 2016 including Autumn Shimmer, Nightfall Mica, Caviar and Eminent White Pearl. The changes to the interior are minute as well, with the ES gaining a redesigned steering wheel and a new shift knob, with Lexus adding Linear Dark Mocha, Illustrious Piano Black and a flatter finish to interior trims. The changes aren't confined to appearance -- Lexus also has given the ES an updated suite of safety tech, dubbed Lexus Safety System+ Package. It combines lane departure alert, steering assist, intelligent high beams, high-speed dynamic radar cruise control as well as the company's pre-collision system, which can initiate automatic braking when the system detects other vehicles or pedestrians in the car's path. Lexus lane departure alert, meanwhile, is coupled with steering assist and can help the driver keep the car in the center of its lane by correcting the steering in small increments. The two engines are unchanged for the 2016 model year, with the ES 350 continuing on with a 3.5-liter V-6 producing 268 hp, and the ES 300h hybrid keeping its 2.5-liter four-cylinder, good for 200 hp. The V6 version of the ES will start at $38,940 for the 2016 model year, while the hybrid will start at $41,860.